The U.S. dollar takes the top spot this week, likely due to traders flocking to the safe haven all week as global data continues to disappoint. Global risk sentiment and counter currency moves were likely the bigger influences on U.S. dollar pairs this week as U.S. economic data points didn’t seem to spark uniform moves among USD pairs on the one hour chart above. 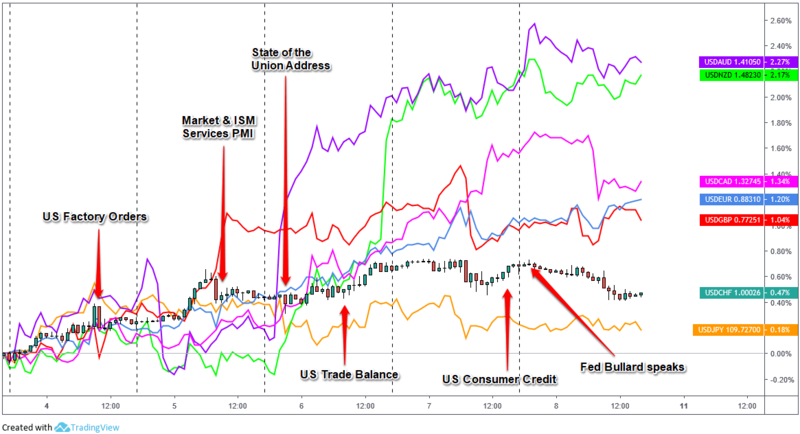 U.S. President Trump’s State of the Union Address was a volatility dud, and even the closely watched ISM non-manufacturing index didn’t spark much movement. Maybe small arguments could be made for the better-than-expected U.S. trade balance data correlating with some dollar support on Wednesday, or maybe FOMC member Bullard’s comments on monetary policy being “restrictive” putting pressure on the Greenback going into the Friday session. But for the most part U.S. influences on USD pairs were really tough to pinpoint. So, we’ll start with global risk sentiment and for a broader rundown of what drove the markets, check out my review of this week’s risk sentiment drivers and its effects on market behavior in my Japanese yen weekly review here. In short, we saw early risk-on sentiment to start the week (likely a carry over from Friday’s bullish sentiment on positive U.S. data), which is possibly the reason why we saw the Greenback start the week strong against the rest of the majors. Traders eventually turned bearish on risk assets from Wednesday on as the picture of global growth turned gloomier, mainly on a heavy week of negative economic reports from around the globe. And the bad news was coming from everywhere. RBA Governor Lowe surprised traders by opening up the possibility of rate cuts in Australia, New Zealand’s quarterly employment report greatly disappointed, U.K. new orders decline for the first time in over two years, and the European Commission slashes eurozone GDP forecasts. Throw on an impasse in Brexit negotiations to raise the probability of a “no-deal” scenario, and it’s no wonder why traders turned bearish on risk-sentiment through the course of the week, and likely why we saw each countries’ respective currencies spike lower against the Greenback and the other “safe haven” currencies like the Japanese yen. Overall, Greenback bulls took no prisoners going into the weekend as it took its place as the one currency to rule them all!